Completely Renovated. Luxurios first-class Condo!! 3 Night Minimum stay required. If scheduling dictates, we may require a 5 night stay during the Holiday Season. Tenderfoot lodge amenities include: two large hot tubs, a large wooden deck with gas barbeque grills and a large Lodge meeting room with big screen TV. There is ample underground heated parking with elevators and a storage closet for ski gear just outside the front door. 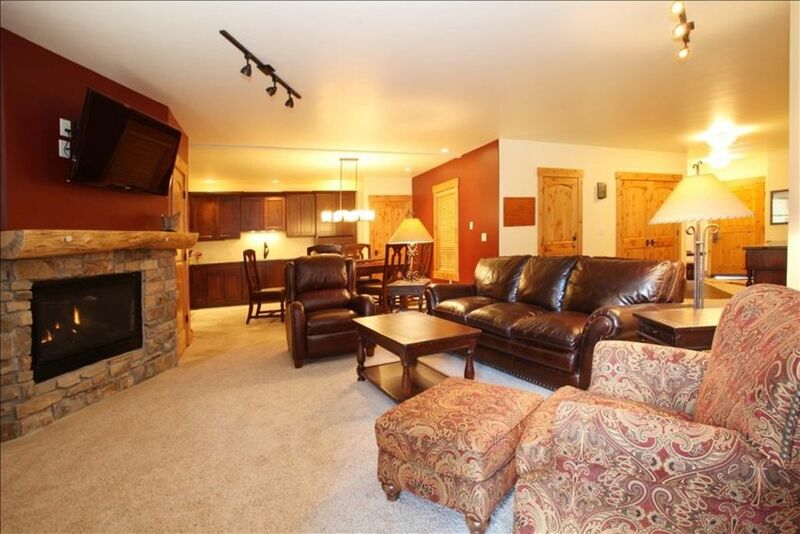 Keystone's gondola and village are just a short walk from this large and cozy condominium. So, if you come to ski, snowboard, mountain bike, shop, enjoy great restaurants, or just relax, you will feel comfortable in this very nicely decorated condominium with great views of the mountain. Keystone offers night skiing, outdoor hockey, skating, cross-country skiing all within walking distance of the condo. During the summer Keystone offers over 100 miles of newly developed mountain bike trails. The bus pickup is next to the lodge. It is a seven minute drive to the Arapahoe Basin Ski $Snowboard Area, 15-20 minute drive to Breckenridge, Copper and Loveland ski areas, as well as 30-45 minutes to Vail. Only minutes away from Dillon and the Silverthorne Factory Outlet Stores for some great shopping. A shuttle is available from Denver International Airport. Great place to relax and make some turns and then enjoy a dip in the hot tub! We have a small deck outside our back door with two new wood patio chairs. This place was perfect for our family ski trip. 5 minute walk to the beginner area slopes. If ski equipment is rented from the Keystone sports mountain house it is super convenient. You can actually drop your skis back off at the end of every day rather than carry them back to the condo. The Hot tub was very close to the condo and a welcomed perk when relaxing after a hard day. when entering the parking garage if you continue on to the 2nd elevator the entrance to the condo is very close. Condo was very clean and the in unit washer and dryer saved us from having to bring too many clothes. The Kitchen and the bathrooms were fully stocked. Once again the ski trip was improved by using this place. Great location, had all the amenities a family would need. Love the path behind the lodge that leads to mountain west vase, walking distance to the lifts! We are glad you enjoyed your time at Keystone. This property is comfortable, spacious and perfectly situated for skiing at Keystone. Would highly recommend. We are glad you enjoyed you're stay at our place. We hope to see you back again. Our stay was excellent. The nicely upgraded kitchen led us to never leave to go eat out. I appreciated the Calphalon pans, Wi-Fi Internet access, fancy duvet covers and all the little touches. If we come back to Keystone to ski with our epic passes, we will definitely be calling on this fine lodging location. Thanks for the great review. We enjoy staying up there also and want to have all the comforts of home. Take care. We spent 2 nights for a ski trip with friends and our son. The place was as advertised and easily held up to all of the great reviews I read that made me book. It was an easy walk to the lifts. The condo was very spacious, nicely updated and had everything we needed. The only thing I would add are more pillows for each bed, a very minor point. Looking forward to staying again! Glad you enjoyed your stay at our condo. There should of been extra pillows in the closets. We will check to make sure they are still there. We look forward to having you come back. Very nice condo with all the amenities needed to get started with your vacation. Keystone is about a seven minute drive to the A-Basin ski area, 15-20 minutes to Breckenridge, Copper and Loveland ski areas, as well as 30-45 minutes to Vail. We are only minutes away from Dillon and the Silverthorne Factory Outlet Stores for some great shopping. A shuttle is available from Denver International Airport. 3 night Minimum stay $125 Cleaning Fee All rental payments must be paid in full 60 prior to the rental date. No pets allowed!